Presented here, a very fine piece of early lighting . . . An oval shaped Pan Lamp made of hand hammered copper with a fanciful brass handle. 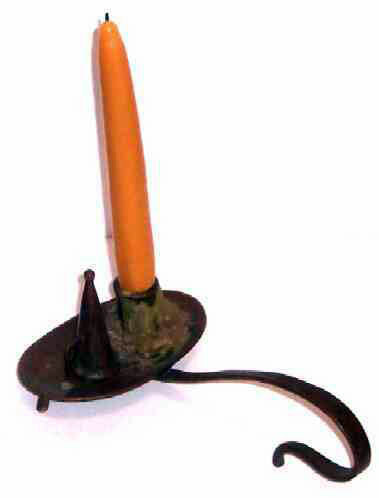 The lamp stands on two feet and the end of the elongated brass handle serves as the third foot for stablilty. This is a real tour de force of design! 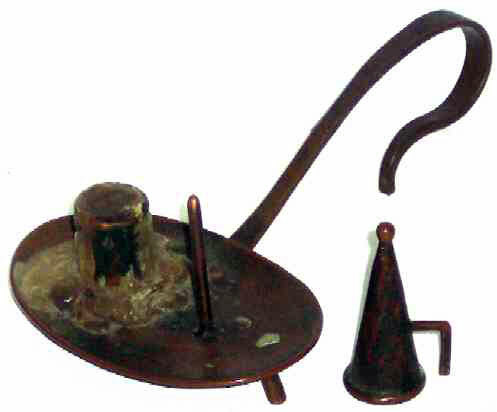 Next to the candle socket, there is a copper spike that serves as the holder for the snuffer which is amazingly still with the piece. The condition is excellent and the patination is outstanding. The years have treated this one kindly! The oval pan is 5" long x 3" wide and the length, including the handle is 8-1/4". We have left this in "as found" condition, leaving it to the new owner to decide whether to clean off the residual wax. This can easily be done with hot water. This little gem is perhaps one of a kind and an inspired creation by a very talented coppersmith.